On October 7th I gave a talk titled “The Transformation Triangle: Public Education, Alternatives & Strategic Litigation” at MindFreedom’s mini-conference in Portland with the theme of Continuing the Creative Revolution: Alternatives to the Medical Model. My very first blog on Mad In America was on the Transformation Triangle in A Three Pronged Approach to Mental Health System Change so I am not going to go over that again here, but in thinking about my talk, I realized that I could piece together a very short video on neuroleptics reducing the recovery rate from 80% to 5%. It is really a very simple case, with all of the pieces supplied by Robert Whitaker, who has always been very gracious in allowing me to use his research. The video is only 97 seconds, which is in the range that people are willing to devote. My hope is that it will reach beyond the Mad In America choir. 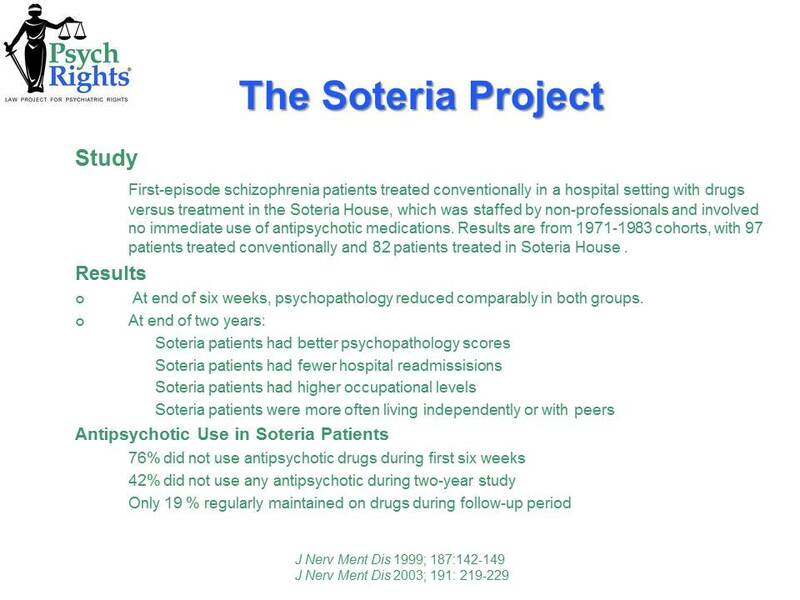 The PsychRights logo is on this slide, but again, this is Robert Whitaker’s slide. So then we compare this to the Harrow & Jobe study of long term recovery rates of people who had been on neuroleptics for a while. Here, we see that 40% of those getting off the neuroleptics recover while only 5% who stay on them recover. 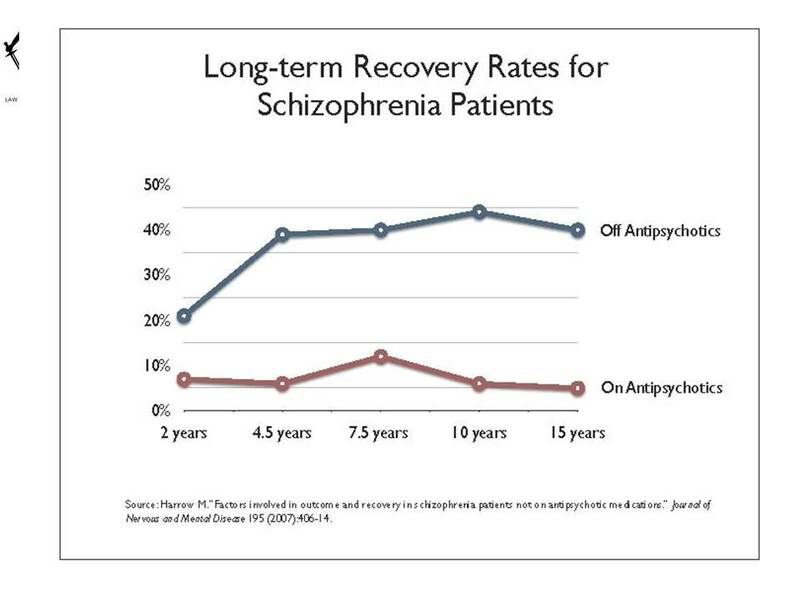 This 8 times recovery rate for those getting off the neuroleptics is dramatic in itself, but the other thing it shows is that once people have been on the neuroleptics for a while, the chance of recovery even if one gets off of them is 40% compared to the 80% rate if one was never put on them. This shows how important it is to try to keep people from being put on the neuroleptics if at all possible. This is what Robert Whitaker has been saying since he published Mad In America in 2002, and all of the evidence since then has just reinforced this conclusion. Finally, a word about words. You will notice I use the word “neuroleptic” rather than “antipsychotic.” The reason for this is that neuroleptics don’t have antipsychotic properties for most people. They just disable people to the point where they are not so troubling. “Neuroleptic” was the original name and means “seize the brain.” This is an accurate description, while “antipsychotic” is marketing propaganda. Exactly. Neuroleptics damage the system and turn most people into longterm psychiatric patients – this is why “Schizophrenia” is the wrong term to use (as the long term illness has been created by the treatment). Thanks for being so brief. And since neither of these neuroleptic induced syndromes are listed as billable DSM disorders, they’re almost always misdiagnosed as one of the billable disorders, by doctors who want to be paid. Absolutely, Jim, it is imperative we “try to keep people from being put on the neuroleptics if at all possible.” And, of course, this is almost always, if not always, possible. Thanks for all that you do. If I was to follow the medical advice all those years ago, I would still be a sick person in Western Ireland – or more likely dead. The very definition of “Schizophrenia” provides an excuse to fail. It appalls me that I was forcibly “medicated” with these drugs and hence actively prevented from recovering, rather than being given proper support and treatment. Not mentioned here either (probably as it isn’t particularly relevant to the main theme of this article) is that these ineffective and dangerous drugs also appear to cause metabolic syndrome (diabetes, heart problems etc), and so shorten patients’ lives significantly and vastly increase both direct and indirect healthcare costs. All up, the only winners with these drugs are their manufacturers and the (hospitalization) industry that sees people incarcerated so they can be forced to use them. I suspect the numbers of lives they destroy and damage done would possibly exceed those destroyed by illicit drugs. You are definitely right about the availability of successful non drug solutions. High Anxiety was a big problem for me when I was withdrawing from meds. CBT/Buddhist Practice helped me to recognise the “catastrophic thinking” pattern (and how to get away from it). And how to recognise that it was possible to see the exact same external circumstances differently from a non catastrophic viewpoint. CBT/Buddhist Practice has also demonstrated to me that from a calm perspective “problems” are not really that “serious”. The British Psychological Society maintains psychological approaches work with people with “Severe Diagnosis” – this is what I found also. My finishing Mental Health diagnosis was very Severe – but my recovery to longterm functioning was very quick once I found the right direction. Obviously every recovered person saves the US taxpayer at least $1 million (in the course of their lives). Several years ago, the local newspaper ran 2 stories in the same edition – (same paper, same day….). They were about the local/State “community mental health system”. You had to carefully read BOTH articles, and do some simple math. But, each so-called “mental patient” represents a MINIMUM of $100K/$100,000.- PER YEAR, in salaries alone. That’s just case workers, etc., not Dr.’s, nurses, etc., and not counting any OTHER costs, which can be more than salaries. And, it’s too long an explanation to go into here, but the gov’t does NOT want to “save money”. The way the gov’t works in America – AND Europe – is it wants to spend ALL the tax money it gets, and always wants MORE. Yes, there ARE *SOME* folks in gov’t who want to “save money”, but that’s not how the system is rigged…. I know several folks who are victims of forced drugging (“depot injection” in Europe…. ), through the local community mental health center, and one drug costs ~$2,000.-/month. They LIVE on $750.-/month disability. Yes, more taxpayer money is wasted on the drugs, than what the person gets to LIVE ON! That’s why I always tell the truth. Psychiatry is a DRUG RACKET. Good to see your comments, “Fiachra”! The security issue doesn’t measure up either. I attempted suicide twice on depot injection and nearly every other Hospitalisation had a suicidal component attached to it. But once I stopped taking the depot the suicide attempts stopped, the hospitalizations stopped and the disability stopped. My problem was extrapyramidal disability and suicidal reaction (akathesia) on Fluphenazine Decoanate depot injection. The damned toxic drugs were causing the very thing that they were supposedly treating you for. And as you got worse they probably wanted to up the number of toxic drugs that they wanted you to take. And they call us the crazy ones!!! It crossed the line into “Organised Crime” many years ago. Perhaps the $2,000 per month should be spent on things like housing and food and social support rather than on the drugs. I suspect that we’d get a lot better results and would eventually end up spending less money. But of course, the problem with this is that people might just get well from their supposed “disease” and the system wouldn’t like that at all. The system doesn’t want people to get better and get their lives back so that they can move back into society and be productive individuals. And I mean productive in ways that the individual feels are productive for them, not necessarily what society defines as productive. For sure – productive is not about approval. Decent housing is at least half the battle. I was given Zyprexa for the anxiety and insomnia that goes with Xanax withdrawal, I never checked my medical records but I think I was also diagnosed with a psychotic disorder because they also gave me the “take it for 6 months” line. Typical drug and alcohol treatment center routine of diagnose the withdrawal symptoms as mental illness for both insurance reasons and as an excuse to give everyone lots of shut you up drugs. I took those Olanzapine/Zyprexa pills for several months every night “for sleep” I was on alot of Xanax and also Adderal / Dexadrine for so called ADHD for years previously so I thought the anhedonia from the Zyprexa was “sobriety”. Zyprexa is an evil drug and its manufacture should be banned. I know these drugs reduce recovery because when my perscription refills for the Zyprexa ran out I went into these hellish withdrawals, insomnia from hell, nausea vomiting and total mental malfunction. When I went to the ER they saw all this as my “illness”… “coming back” . Only one problem I was not “ill” before taking that diabolical drug BUT that did not stop them from just sending me home with more Zyprexa. The 10 or 15 pills I got were not enough for me to taper with so I went back to that ER demanding treatment for the withdrawals and an explanation for the nausea vomiting, I was scared being that sick help me. Tell me why this is happening. I am sent up to psych where they try and coerce Geodon. I refused it and only took the 8Mgs of Atavan daily. I was there for over a week and went home on that dose. My point of sharing my story is to point out that these drugs are so horrible that they can even turn an anxiety problem into a psychotic illness and once you are on that path no one will help you get off it. I start with Anxiety, take the drugs, hate the anhedonic effect and attempt to quit and get really really sick and now they tell me the withdrawals are “schizoaffective disorder”. I knew better. These drugs not only reduce recovery rates with reckless prescribing they are causing many people to become chronic mental patients by making them sick in the first place. I don’t have the writing skills to adequately describe the hell I went through but it is no coincidence people who write about effects and withdrawals online always use words like Devil, hell , diabolical and evil to describe Zyprexa. “Take it for six months” that line is like the psychiatric version of a death sentence. I really did a poor job of explaining the hell, I forgot to mention the part of pacing back and forth in the house during Zyprexa withdrawal for hours and hours on end trying to hold on only taking breaks to vomit out the back door onto the steps and the vomit stain getting half an inch thick cause this went on for weeks. I was very worried I was going to die cause I could not eat and worried I had permanent brain damage. The hospital denying that I am having withdrawals because that diabolical poison is “non addictive” , so non addictive that you get sicker than a person kicking Heroin trying to get off it. Just be grateful that you are alive as so many are not, having died from myriad reasons due to Zyprexa. I also could not believe the effects I witnessed in my loved one when Olanzapine was introduced. I always wonder how much of the terrible time they had afterwards was due to drug withdrawal vs symptoms of distress (for lack of a better word). I often think in our case if it was both-that the drug use and withdrawal fueled the distressed responses into something unmanagable. I was curious if you experienced all these horrible symptoms after ‘tapering slowly’, or if you were forced to stop more suddenly, and how long your symptoms went on for. Thank you Jim for all your efforts in this area, and for thinking of ideas that may reach a wider audience. You have the right writing skills cat.I can see exactly where you’re coming from. A lady friend of mine went for some special counselling a few years ago and the people were really nice to her. They got her onto loads of drugs and told her she needed them for her problems and she consumed the drugs because the staff were so kind. Eventually she ended up developing an eating problem and gained about 5 stone. She developed obesity knock on health symptoms and was hardly able to walk. She got away though, and weaned herself off the drugs with the help of self supporting independent drug abuse groups and she’s now getting her weight down sucessfully. She says she knows what she is now and who she should trust – her own type of people that want her well. GOD BLESS YOU, Jim Gottstein! Thank-you for laying out the proof of what some of us have known for many years! From roughly age 15 -35, ~1974/5 – 1994/5, I was “diagnosed” with a wide variety of (bogus) “diagnoses”, and DRUGGED with literally ~50 different drugs. Thorazine, Mellaril, Stellazine, Haldol, Navane, Cogentin, Triavil, Imipramine, Tegretol, Depakote, Ativan, Librium, Valium, Xanax, etc., And, I (almost) always took whatever was prescribed, exactly as prescribed by whatever quack shrink I was seeing at the time. I was last hospitalized in 1994, due to a toxic Trazodone episode. The local CMHC did NOT ever do a blood-level check, and it built up until I went nuts. That was my 3rd near-fatal toxic drug episode, and soon after, I quit the whole pseudoscience drug racket of psychiatry. I’ve been “shrink proof” for over 20 years now, (and sober from alcohol! ), and I couldn’t be happier about that! But, I still need Social Security Disability, and EBT/food stamps, and housing assistance. Within my limits, I’m VERY functional. But, sadly, I know several people here in my small hometown who are still hooked into the psych drugs/CHMC DEATH TRAP….. It’s sad to see the results of long-term psych treatment – it’s disability and death. Dr. Breggin’s “Toxic Psychiatry” was ticket to the life I love today. And it’s YOUR efforts, Dr. Gottstein, which inspire me to continue. How, and what can I do to help you do what you do?…. If only we all could make them so! What works works and what you’ve already mentioned has been proven to work. Thank you for your article. Even these years later I am stunned by the neuroleptic toxic effects I had and my psychiatrist kept saying he’d never heard of them before. I had Tardive dyskinesia, Tardive dystonia, Tardive Akathisia (which meant I couldn’t sit still, I paced for hours, I couldn’t sleep for days, excetera). On top of this nausea, stomach pain, Reflex, insomnia, confused thinking, the list is so numerous I don’t think there’s space here for them. I was told these ADs and neuroleptics would make me better and whatever recovery I had during this time was blown to pieces by the poly drugging. To those reading this I successfully tapered off all the drugs, later when I went to other psychiatrists they said not only was I not mentally ill they were baffled how I’ve been diagnosed as mentally ill in the first place? How can one psychiatrist drug the crap out of you on what he thinks is wrong when it was all drug induced? Because he can. Maybe that’s what you’re supposed to do when you discover you weigh 300 pounds. That way the company doesn’t have to worry about you warning others about the drug’s chief side effect. There’s been a large increase in neuroleptic suicide/homicide in Ireland in the past 20 years.This has been attributed to the general population increasing use of SSRIS and other gateway drugs. I don’t have to see your video or read your statistics. What is personal to me is how what started out as a little Lithium and a little SSRI or rather I started with Tegretol, but could not take it because it lowered my white blood count enough to nearly endanger my life. What started out as a couple of “little drugs” ended up as taking big-time neuroleptics along with up to nine drugs at a time, almost led me to death through a serious sleep. You could say, Thank God, I woke up!! But, what sticks out in my mind is that it reminds me of our teachers, parents, law enforcement and others telling us that one little smoke on that marijuana cigarette will lead to harder, more horribly addictive drugs. Yes, perhaps, but that is the way it starts in the psychiatrist’s office. So, of course, the individual would recover better without the use of the neuroleptic drugs or any of those awful, harmful, toxic, addictive psychiatric drugs. Of Course! Thank you. Unfortunately, I am not able to make a cogent response to this. This could be a sledgehammer or another rambling buried in the records of nowhere. It’s time for people better than me to rise up. I think it is not so simple and easy to say that “neuroleptics reduce the recovery rate of psychotic people from 80% to 5%”. This statement is simplistic and ignores many potential confounding factors in each study, along with minimizing other possible causal factors in each of the two outcome scenarios. Such a statement might sound good if one is against psychiatric treatment – as I mostly am too – but the question is, it your assertion any more valid or founded in clear logic and science than a lot of what the other side says? For example, in the Open Dialogue results, psychotic people are given intensive family-oriented social support, often combined with individual psychotherapy, for months at a time. This social support is probably crucial to the good outcomes in many of the 80% who recover there – it’s not only the lack of neuroleptics alone that account for the good outcomes, and the drugs’ absence could be partly or wholly correlational too. So to say that “neuroleptics reduce recovery from 80% to 5%” fails to take into account the complexity of the causal factors beneath the surface. Psychotic people in the 80% good outcome group also live in a relatively less individualistic northern culture (Lapland in Finland). Meanwhile, it is not clear what level of psychotherapeutic social support the people in the Harrow study experienced. 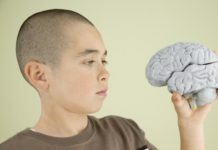 I remember that it was not clearly reported in the Harrow studies how much and what kind of social supports were available – a typical omission in a study by psychiatrists who mistakenly believe that a person suffers from a brain disease that operates partly or wholly independently of social context. But, generalizing to how most American psychotic people are treated, we can guess that very little intensive individual or family psychotherapy was available in Chicago. If this is true, then again the groups in Finland and Chicago are not comparable, and the statement that neuroleptics reduce recovery from 80% to 5% is simplistic and misleading. I say these things as someone who is absolutely against the disease model, mostly against psychiatric drugging, etc. In opposing these things, I think we need to speak carefully and have a careful understanding of causal versus correlational factors in interpreting people’s outcomes in variable settings. And, I would question whether your presentation of neuroleptics in this case demonstrates a careful understanding of the issues. The statement “neuroleptics reduce recovery from 80% to 5%” makes it sounds, to the uninformed reader, as if neuroleptics alone or at least primarily are responsible for reducing recovery rate in this way, and this is certainly misleading. I believe this analysis is correct, i.e. that studies such as the Chicago study and the Open Dialogue studies should be viewed “as yielding possibly useful knowledge in limited domains for a limited time”. We like to think that these results are generalizable to psychotic people in other places, but due to the unpredictability and complexity of human functioning, perhaps we should be more careful in making overgeneralized statements. Secondly, I encourage you to be more careful in presenting possibly correlational factors (such as drugs) as causal ones, since your credibility is not enhanced by confounding the two. Again, I say this as someone who supports the Open Dialogue approach and is against most drugging. I think the article was about getting the basic “good news” message across. I can’t see a community solution in Finland working in a big city like London; and I can’t see myself just stopping meds and surviving (as in “Harrow”..) – but I have to say that I don’t know. Fiachra, the title of the article is pretty clearly about antipsychiatric drugs doing harm – – and the title’s wording also suggests neuroleptic drugs as the proximate cause of recovery being reduced from 80 to 5%, which is misleading. Yes, there is also good news, i.e. that recovery rates could be much higher. But that was not the substance of what I was discussing here. Yes I have read Whitaker’s book, although from your response, I wonder how carefully you read my comment. To me and others, it’s pretty clear that making a claim based on single quasi-experimental studies about what neuroleptics do generally is misleading and may confuse correlation with causation. This doesn’t mean I don’t believe that the drugs are often very harmful – of course I do. I have taken them myself and so have other members of my family who have been very harmed by them. So research to get a drug approved by the FDA for the market is legit, but research that doesn’t support that marketing strategy is “quasi-experimental”. I dunno, Matt. I’ve never felt that psychiatry was particularly ‘credible’, however, it really goes out of its way to present itself as such, and it has the resources (blood money) and the PR to do so. I see it as an uphill struggle, but I don’t think the facts support psychiatry, nor the drug industry, on this one. “Often very harmful” is dead on correct. “Often very harmful” translates into generally more harmful than helpful. It isn’t in psychiatry’s interest, as it is so tied to the drug industry, to even go there. The drugs are actually debilitating. I know from personal experience, but that isn’t enough to convince anybody. This is what the evidence says. As for credibility, bio-psychiatry isn’t even looking at the evidence. If the evidence is right out there in front of their noses, it becomes harder and harder to ignore. Suddenly the idea dawns on somebody that what is being done is helpful, and somebody is going to be saying this just isn’t right. Should more and more people say so, then real change is going to be demanded. It only looks sensational if one doesn’t look at the matter closely. The drugs are not rehabilitative, or curative, in actuality. Instead, they are debilitating. What do you get out of their use? A rising disability rate, and the costs to the taxpayer of supporting more and more people on disability. That said. Furthermore, I’d like to say, thank you, Jim, for this excellent and informative post. People need to know, and you’ve got the facts for them to scrutinize. I think you are missing the big picture. Open Dialogue, which tries to avoid neuroleptic use and does for 80% of people experiencing what is considered a psychotic break, achieves an 80% recovery rate. This contrasts to other parts of Finland using the standard “neuroleptics for everyone” approach which sees the same virtually non-existent recovery rates as the U.S. and the rest of the West. I wanted to have a very short video that had the potential of gaining some traction outside of the choir and the nuances you bring up could not be included. It was meant to be provocative. However, the argument is valid. Open Dialogue achieves an 80% recovery rate for first episode people by avoiding neuroleptics if it can. The Harrow & Jobe naturalistic study shows that 40% of people who have been on neuroleptics and get off recover and 5% if they don’t. The argument is as simple as that. 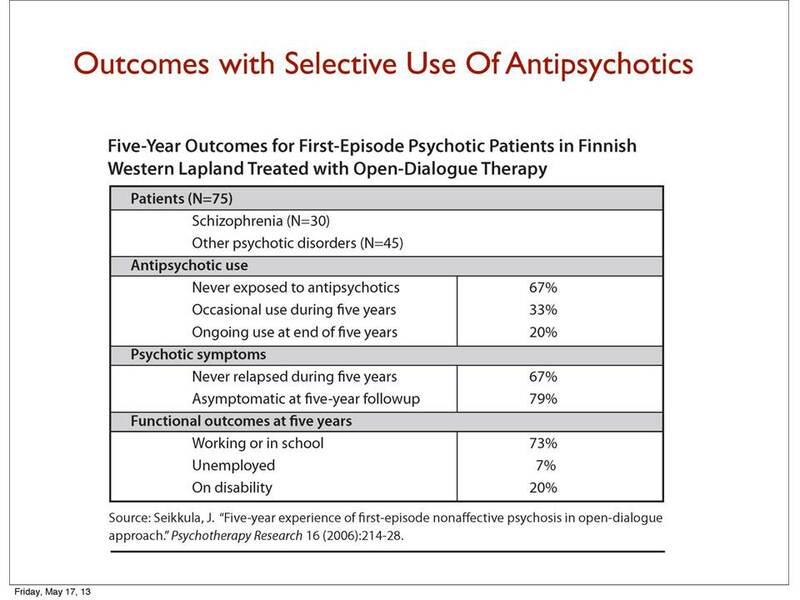 Of course, Open Dialogue has its own psychosocial/community approach, but the point I am making is that avoiding the use of neuroleptics achieves an 80% recovery rate, while using them the way we do in the U.S., achieves a 5% rate. The point that doesn’t seem to have come through as clearly as I would have liked, though, is that once people have been on the neuroleptics for a while only 40% who get off of them recover, which is half the rate of those who were never put on them in the first place. Hi Jim, It is not at all that simple. 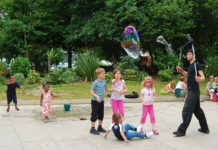 In the Open Dialogue approach it is not simply that neuroleptics are avoided whenever possible, but also that substantial recovery-oriented family, vocational, and other social support is provided for a long period. These latter factors, and the philosophy behind them, may be crucial to achieving the 80% recovery rate. Therefore, creating a title suggesting that neuroleptics are the one or primary causal factor in reducing recovery from 80 to 5% is misleading – it would be better to admit that there is significant uncertainty and lack of knowledge about these causal (vs correlational) factors. To me this is more intellectually honest given what we know and especially what do not know. There is a lot to Open Dialogue, yes, but it was a simple matter to get better results, the simple matter of ceasing to use drugs in the excessive fashion that conventional psychiatry uses them. With all that support you get an 80 % recovery rate, however, without it you’ve got the 40 % Yarrow & Jobe recovery rate. Keep a person on psych-drugs, and the chances of that person making a full and complete recovery goes down substantially. I’m not surprised at all that he would come up with 5 %. That’s a 95 % non-recovery rate. It must take an exceptional person, as these studies show, to “function” on neuroleptic drugs. I wouldn’t exactly call that “a lack of knowledge”. My take away at looking at Open Dialogue results and comparing them with Harrow & Jobe’s study is that once people are put on the drugs for any length of time, the chances of recovery go down from 80% to 40%, i.e., they are halved. Interesting, and in that regard, we can let the stats speak for themselves rather than brush them under the rug. When the recovery rate on drugs is almost opposite what it is without drugs, that kind of speaks for itself. I’d say there is a great case for doing what in the mental health system is so seldom done, and that is not introducing patients to drugs in the first place. Do so, and you would undoubtedly have even more evidence supporting either using neuroleptics much more sparingly, or not using them at all. Mr. Frank Blankenship states that “there is a great case for what in the mental health system is so seldom done, and that is not introducing patients to drugs in the first place.” I definitely agree. There are a million other ways to help a person in distress that the “mental health system’ seems to refuse to consider. Not only that, each “case” is “individual” and the “treatment” should be “individualized.” I would hazard to that most of the time, the person does not need “treatment” at all, just the permission to make his or her life better in what situation there are “in”. Sometimes, there is definite abuse involved and they need some kind of protective situation. However, 99.9% of the time, an individual will be seen in an “evaluation” where a “diagnosis” is made on one “flimsy” encounter (or interview), then carted off to an “LCSW Therapist” who will talk to you for five minutes, maybe, and then get you scheduled for a “med evaluation and review.” The person is then “hooked.” They usually know no better and if they do, they are actually afraid to offer an objection. This has been the state of the “mental health system” for more than twenty or so years. The very first time this happened to me, my sister, who did eventually pass away from cancer said to me, “I don’t want to lose you!” She is in “heaven” now, but her words still to this day haunt me and this was at least ten or more years before Robert Whittaker’s books. I guess she knew something we are all finally “coming to grips with”. Thank you very much. Yes, these drugs are debilitating, more than debilitating. They are extremely toxic to body and mind, the whole human being. They are addictive, most probably more so than alcohol, nicotine, or caffeine. (Some of Americans and others in the world’s favorites) The can make you into a “zombie” and steal your real, true self from you, that which makes you, that which makes you love yourself, others, your God, or whatever. They steal your ability to earn a living, even when you are doing something you love or don’t love. They steal your memories. And, they can kill you. Yet, they prescribe like “penny candy” and say (all lies); “Oh, this will make you feel so much better.” I imagine if feeling like a zombie, having that which is you stolen from you, becoming addicted without your consent, shortening your lifespan and nearly killing you, if not killing you, then I guess, it makes you feel, “oh, so much better.” These drugs and perhaps now even the more “medically based” drugs are the absolute biggest lies pitched to the vulnerable population of many nations. This is terrorism, terrorism that makes the awful stuff of “ISIS” and others look almost like “kid’s stuff.” This is a danger to our national security, as much as “ISIS” and other things. I read a lot of stories similar to mine. I say what I say from personal experience. Perhaps, you have read my other posts here and other articles and blogs. If you remember in the early and mid 1980’s we were afraid of AIDS and sadly, good people were getting sick and dying. Then, those afflicted and those affected by those afflicted started to speak up! We need to speak up! I will admit that I am not the kind of person willing to engage in wild protests or get arrested for the cause. But, it is time, we speak up! I know we are beginning to do so on many web sites and the internet. I do think that at the right time in the right place, the right person will speak up and as my dad would say, “get the ball rolling.” I am under the belief that within a year or two or maybe less after this political election, we will be able to speak up. We need to talk to our congress people. We need congressional hearings. We need to make the world awake and aware of what is going on. I admit to wanting to maintain my anonymity, but, I will lend my voice when able. The AIDS protestors had a movement called “ACTUP.” Perhaps, we need something called something like “SPEAKUP” and “JUST SAY NO TO PSYCHIATRIC DRUGS.” Thank you for hearing me out. I think most people are unaware that the actual illness of “schizophrenia” doesn’t exist – and that there are perfectly good solutions for people in “Crisis” – but only outside of Psychiatry. The message is simple, and I like your appoach. Of Course not! How could they when they see the word used in news reports, in television dramas, in movies, books, in magazines, and periodicals, on the internet, wherever people get their entertainment or their news. or any information from celebrity news to fashion to recipes even to travel, etc Sadly, unless actually confronted, most people never think to ask is schizophrenia or depression or bi-polar disorder real diseases? It is even more of a problem when a well-known celebrity comes out and says they have one of these or other fake diseases and are receiving treatment for it or if you see an elected official or someone wishing to get elected begin speaking of more money for mental health or more mental health services need to be available to the people. In the latter, because of lack of knowledge or otherwise, it just means more to be “drugged.” I think, in the former, celebrities are just like some of the rest of us were or have been; duped by lies from “alleged authorities.” Thank you. There’s a definite UK focus now on Prescribed Drug Dependency BUT Neuroleptic dependency seem to be left out in the cold. Even though the effects of Neuroleptics are costing a fortune. Patty Duke used to be a good actress. Once she went on the psych drugs she never worked again, except as a drug shill and poster child for “mental illness.” Finally died at the ripe old age of 67–old for a psych drug junkie! Yes, I am sure others would agree that in the US they are finally concentrating on opiate dependency and also the relationship to a greater Heroin epidemic. I know there is a lot of pain and even death involved with these problem and they need to be addressed; but, I feel, partly, that it is being addressed because it is hitting the white middle to upper middle class in suburban and small town New England very badly. The Southern US has a similar problem; but the “meth labs” I think predominate. No one has yet to really address the severe problems of the psychiatric dugs and how they actually relate to these problems. The main issue with the psychiatric drugs is the absolute denial of so many; this includes the prescribers, law enforcement, education, and even the families and individuals affected. Until, we make the jump to realize that taking these drugs is as “evil” as the others and realizing that the psychiatrists and others are really just “pill pushers” we will never get anywhere. It would be horrible if it just affected the ones who took these drugs; but, they are now getting into the water system, seeping into the ground, etc. So, they are also developing a grave environmental impact. But, somewhere, in side me, I know the truth will prevail. Despite everything, believe it or not it always does. This and other websites and organizations and those willing and able to speak are our first hope, our first line of defense in a horrible war. Thank you. You’re 100 per cent right. Also on the BBC today concerning tragic deaths of vulnerable people. I can only associate risk to life with “medication”. I agree with your take on things concerning Open Dialogue and peoples’ ability to access it. My fear about Open Dialogue here in the United States is that it will be pushed into the present “mental health treatment” to make it look as if the system is doing something new and helpful. But, in reality the system will never be true to the principles of Open Dialogue as it’s used in Western Finland. It will end up as a parody of what it should be. The system has done this numerous times with other things. It’s taken over “recovery” and used it as a buzz word without truly working to help people get their lives back in ways that are productive to the individual and society. The system will tout its new Open Dialogue approach while still pushing the toxic drugs down the throats of everyone it can get its hands on. If Open Dialogue is to be used successfully the clinical staff implementing it must first take on the attitude of the staff who practice it in Finland. That attitude must be one of profound humility and the admission that they know nothing until the person labeled as “sick” tells them what is going on. They must lay down and deny the exalted position of the “authority” on everyone’s lives and the idea that they know absolutely everything. I find very few clinical staff that I’ve dealt with, both as “patient” and as co-worker, who are willing to do this. You might find that lots of people overcome Crisis the same way, whether it’s Open Dialogue or the ‘Simon Community’. But anyone sleeping in doorways is likely to become distressed. Have a similar problem in rural Indiana. My family believes I’m compliant, but are worried because I’m irritable and sick from withdrawing from effexor. My skin is dry, itchy and burning. My corneas keep ripping off when I wake up due to chronic dry eyes and abrasions. (At least an eye doctor verified that!) My muscles ache and even a brief walk winds me. And I keep coughing from congestion–my saliva is too thick to swallow properly. They are torn between accusing me of laziness or depression. I encourage them to believe the former. Ugh! Jim – First off, thank you for making the clear distinction between terms – antipsychotic versus neuroleptic. I will try to remember this in the future and not ever say antipsychotic (“a marketing term”) again. As for Open Dialogue and Soteria House results, both bespeak a clear need for both humility and training on the part of those who work in them. These qualities are in very short supply in the “mental health” system we currently have here in the states. Many are poorly paid and poorly trained, if at all. And, over all, rules the Doctor and the Billing Department. How to turn this around, other than to make proof of it in medical schools and then force the Insurance Kings and Doctor Gods to adopt the model??? Public Attitudes, Other Choices, Strategic Litigation. Failing to understand this is why the Anti-Psychiatry Movement is stalled. Have to deal with the world people live in. This means we have to deal with Psychotherapy, Recovery, and Healing, and with the child exploitation which the middle-class family is built upon. We need lawyers, not therapists. We need to make strategic lawsuits. Doctors who prescribe drugs for bogus illnesses, Therapists who market a FixMyKid service and violate mandatory reporting, and parents who scapegoat their child, should all be getting sued. And count me as a Hazardous Duty Process Server, reporting for duty. Do you know of any forum where these legal issues are talked about and where we can see the current high water marks? People trying to do something about these problems, rather than getting lost in Recovery and Healing. NARPA, the National Association of Rights Protection and Advocacy is the best one I know of. http://narpa.org/ It is composed mainly of psychiatric survivors and lawyers and has an annual rights conference. I am lucky in a way that I have no teenagers about ready to embark on the journey of adulthood. I think many parents in previous generations were worried whether their children would go to college or not. They had hopes for a better life for their offspring. I would prefer to be the eternal optimist and in most cases I am. However, when I look at the choices of today’s young people, it seems that these might be their choices; “Do you want to be ‘drugged’, ‘locked up’ or worse?” Having been “drugged” and having worked as a “prison guard” in a “former life” I think it would sadden me that it seems these are choices for many of our young people. I have heard and I think “Time” magazine has written a “cover story” on this; that today’s young people might be the most “distressed” in generations. I have not read the article. I only heard a little bit on a tv news show. Thank you. Frank B. is primarily concerned with eliminating forced psychiatric procedures. I also want this, but just so long as in so doing no one is advocating for the concept of mental illness, or for therapy, recovery, or healing, or otherwise seeking pity. Now anything which goes thru a state legislature is subject to negotiation and amendment. So if you have a simple but revolutionary idea, I have suggested a state initiative. Often this is how radical changes occur. So what do you think about this idea, and has anyone ever tried it. I have suggested starting in Vermont. Has anyone chronicled the forced procedure laws and actual practices state by state and for other countries? It will of course be necessary to have answers for the common sorts of objections. The Treatment Advocacy Center has a list that purports to describe commitment state by state. The Treatment Advocacy Center, of course, is a big proponent of involuntary commitment and forced drugging. I appreciate what Nomadic is saying. I think Nomadic is concerned about those who really do need help, if they will get help; that is, if the effects of the “psychiatric survivors” prevails in the national and state legislatures and in the field, generally. However, in the twenty-first century, seemingly since the about the late 1980s, when the drug “Prozac” was brought to use by the general public, all we have is “forced psychiatric ‘treatment.’ ” I put treatment within quotes within quotes, because this type of treatment is absolutely no treatment at all. It is coercion and even enslavement. Now, we had “psychiatric-type drugs” prior to the late 1980s, but a dangerous paradigm shift occurred at that time. Before, most “emotional/mental” distress was considered transitory, temporary, and recoverable. At the core of many “therapists” was the concept that most “patients” were whole, worthwhile individuals who had lost their way in life. Also, prevalent was a concept known as “self-fulfilling prophecy. If I think I am crazy, then I will be crazy. Most “therapists” worked to erase that and other negative thinking from the “patients’ ” brain. Of Course, this was not 100% everywhere, but, it was mostly the norm for most of the middle class, who were probably primarily younger and maybe some older women. But, then came “Prozac.” “Prozac” has proved to have major side effects, but from that point on, psychiatrists, therapists, Big Pharma, etc. were basically “hooked.” Since that time, “drugs” have been the mainstay of treatment for all ages, children through the “elderly.” I have heard them even used on “infants.” Of course through the same time period, grew the “ADD and ADHD diagnosis” and the use of addictive stimulants on our children and adults. Now, what do we have a highly drugged nation, a highly addictive nation, skyrocketing levels of “obesity” “diabetes” and other such diseases. We also have women even more hurting due to their feelings of self image hurt and dare, I say, as an election nears, a highly drugged electorate. When we do finally unravel this “drugged” mess and “dry” and “clean” ourselves; it will probably feel like a “Joyful” experience that we might have experienced had we lived at the end of World War II. I imagine, that wonderful historical experience, may even pale before this. Thank you. No one needs “help”, at least not the kind that comes from Psychiatry, Psychotherapy, Recovery, or is called Healing. What we need is Political Consciousness Raising, Political Action, and Restorative Justice. Please Never Forget that NAMI (National Alliance for the Mentally Ill) is the same kind of organization. They pretend they are there to help the “distressed” but they are actually there for what I call people suppression. I am sure in these political times, you have heard of voter suppression, which is very much against the virtues and tenets of American Democracy, this is even worse. This is people suppression; the real true selves of each individuals suppressed to zombieism and death through toxic drugs and various forms of false incarceration; they dare to call anything from “out-patient” to “in-patient” to “psychosocial recovery” to “vocational rehabilitation” to other such rubbish that in conclusion take away that they mistakenly say they are trying to “make better” This is the worst betrayal and terrorism of all and is much a form of a threat to national security as the others things they say are. Thank you. rebel – I’m sure you’re aware that much of NAMI’s funding comes from Big Pharma. Tragically, I am aware of NAMI and Big Pharma are in ‘Cahoots.’ And, to think, for awhile I tried to “cozy” up to them, and “tell them my story.” And, also, I tried to get my mother to go to one of their “fake classes” that “taught” the “family members” how to get along with the “allegedly afflicted.” Now, this is one of the few times, my mother actually did something very right, but, I was not aware of it at the time. She refused to attend those Saturday classes. Maybe, it was because, she felt she needed to not stray far from my father as he was pretty sick, although, I told her I would look after him; but, she did not go. Good thing! I was drugged then and could have affected my father even worse and GUESS WHAT! I was never defective or mentally ill at all! Thank you. Please, can anyone enlighten me. 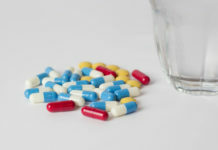 I have read many of the terrors of the withdrawals from these evil drugs from others and I know what I have experienced. Although there are “differences” in what each of us experience, there seem to be a lot of similarities in withdrawal “symptoms” And these seems to be “across the board” whether it is a “benzo”, anti-psychotic, anti-depressant or even lithium or who knows what. This causes me to think, consider, and question, are there any real differences in the “chemical structure” or are all these just re-arranged molecules and chemicals like water is to ice or snow. Now, I am beginning to believe these evil drugs are similar to “snow”; that is if you consider how many different words the Eskimo People have for the word “snow” in their vocabulary. Could it be, no matter whether you take an anti-psychotic, anti-depressant, anti-anxiety, etc. drug, you essentially taking the same thing and the moecules and chemicals have been re-arranged for the worst sales lie to the public, ever.